It’s not a mission field; it’s a disaster area. That was the consensus from members of a Florida Conference team who visited Haiti earlier this month as part of the Haiti Response Plan to the January 2010 earthquake that devastated the country. 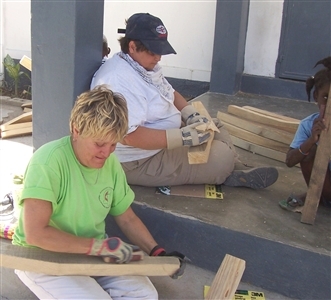 The 10-person United Methodist Volunteers in Mission (UMVIM) team worked in the city of Cabaret at the Haitian Methodist Church and its school. “It was probably the hardest UMVIM trip emotionally that I have ever done,” said the Rev. Hollie Tapley, a member of the team and associate pastor at Memorial UMC in Fernandina Beach. “As I’ve been processing and re-reading my journal, I think what I was not really prepared for was seeing just miles and miles of tent cities. All you could see was just blue tarps. To know there’s no running water and electricity there … that’s probably been the hardest thing I can’t really get out of my mind. And to see people just on the streets with nothing, begging you to buy something or give them something … you can’t even make eye contact, they need so much. “It’s not a typical mission field. It is a disaster recovery field,” continued Tapley, who is also the Florida Conference UMVIM chair and sits on the Haiti Covenant Committee. 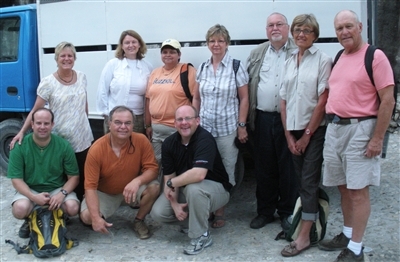 The trip was funded by a United Methodist Committee on Relief (UMCOR) grant, and was part of a priority project identified by the Methodist Church of Haiti. The Haiti Response Plan (www.umvimhaiti.org) is scheduled to last for three years, with the possibility of the work continuing if needs still remain. All team members had been through early response training and more than half were equipped in spiritual response training, said Greg Harford of the Conference’s Disaster Recovery Ministry staff — but none had been to Haiti before. The team spent most of its time building and sanding pews for the church in Cabaret. Part of the team also finished putting stucco on a security wall and others spent time interacting with children in the community. One of the most difficult things for the team members, Harford said, was the direction from UMVIM/UMCOR to not give items to the residents in Haiti. Volunteers are asked during orientation to not leave any items behind at a work site, but to bring everything back to the United Methodist guest house where a final debriefing takes place as well. Team members also are asked not to give out e-mail addresses and phone numbers. 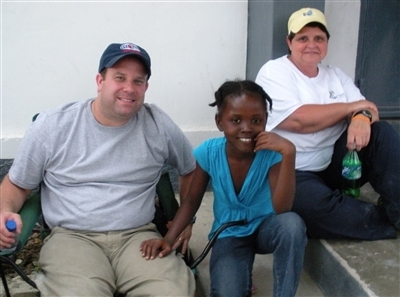 All of these guidelines are designed to prevent inconsistencies when Haitian residents encounter visiting mission teams. The team also led a Sunday morning church service, with the Rev. Jeff Tate preaching through a translator and joined by Tapley to serve communion. Tate preached on Numbers 16, the story of the Hebrew people complaining as they stood in front of the tabernacle and beginning to die because of their disobedience. “Aaron comes out with fire from the altar and stands between the living and the dead. I related that this is how Jesus was hanging on the cross for us. Spiritually we’re dead, and we can come alive and accept him into our lives. During the weeklong trip, the team visited a hospital and then went to College Bird, a school in Port-au-Prince run by one of the oldest Methodist churches in Haiti. Both the school and the church were heavily damaged in the quake. Kneeling impromptu at the church’s oval-shaped altar, Tapley began to pray out loud. She prayed for Clinton Rabb and Sam Dixon, United Methodist leaders who died during the earthquake, and for the people of Haiti and that they would be filled with hope. “Kneeling and praying for the hope of Haiti and for faith to be restored was the beginning of the healing of my emotions, even though I’ve still struggled since I got home,” Tapley noted. Tate said he was impressed by how well the United Methodist Church is organized in Haiti, describing the plan there as “cutting edge.” Each visiting team is asked to bring $3,500 in funding beyond travel costs, which UMCOR then matches so that two Haitian workers can be hired for each short-term missionary who goes down there. In the past decade, Tate continued, individual churches often adopted a Haitian church and would come to the community a couple of times per year and do mission work. “But nothing was happening in that community mission-wise for the time in between. If there was a project of building a church, it might take five or 10 years to actually build the church. But UMVIM has established that the teams go to a community and continue to send teams until the projects are completed, and then they move on to the next project,” he said. Harford emphasized that any groups feeling led to go to Haiti should work through the UMVIM/UMCOR process, and honor the priorities established by the Haiti Response Plan. Each member of the team has been tasked with building a new team to take a future trip to Haiti. Harford and Tate plan to head back in early 2012, but Tapley is going back as soon as September, and is wrestling with how to prepare the members from her church to see and experience what she did. “We’re going to keep talking about it. I will show pictures, and try to prepare them for those things,” she said.